For my second Burnt Offerings post, I had hoped to give you one of my mother’s rusk recipes. I wanted so badly to tell you all about how wonderfully my rusks came out, and how easy they were. Not-so-runny batter in a not-big-enough bowl. Here’s what happened: I decided to start from the top of my mom’s “Burnt Offerings” stack. It’s called “Anna-Marie’s rusks”. While making the recipe, I realised how utterly huge the batch is. I mean HUGE. I didn’t even have a bowl large enough to mix the batter in, so I had to do it in stages. 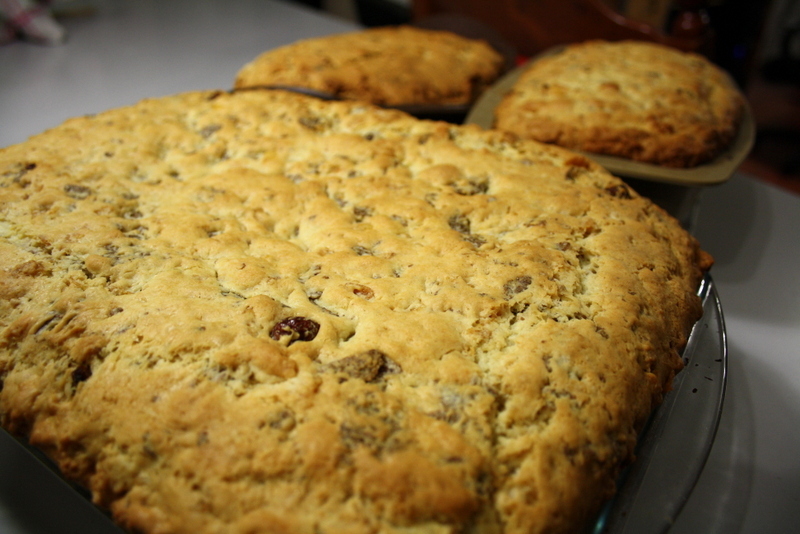 Same with baking – it took two bread pans and a big glass dish to contain it all. It looked delicious fresh out of the oven. Also, I had kind of low motivation since neither my husband nor I actually really enjoy rusks. But never mind that now. The consistency of the batter was all wrong, judging by the note in the recipe that says “Batter runny”. So the rusks were crumbly. Not only did they not slice nicely into neat little units, but they tended to drop half of themselves into your tea after a bit of light dipping. 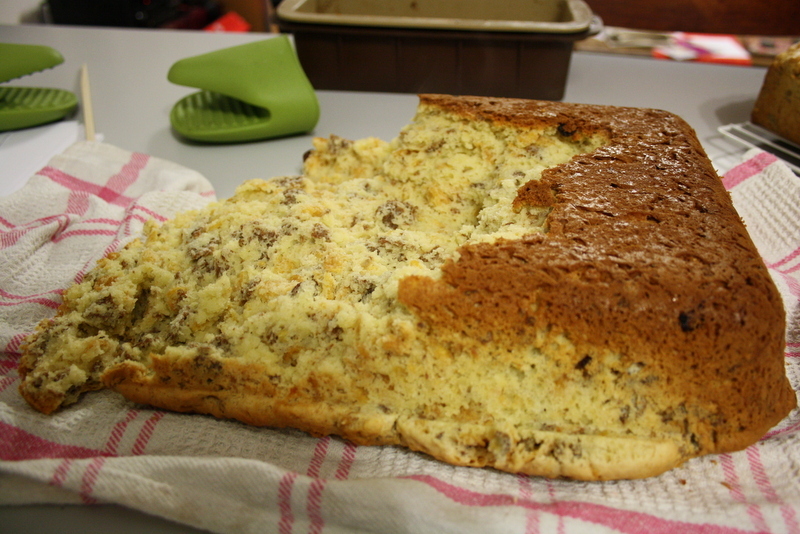 …And this is what happened when I tried to flip it from the pan. I’m not sure what I did wrong; it could have been a variety of factors. I used several substitutions on this one: butter instead of margarine, milk & lemon juice instead of buttermilk. Also, I couldn’t find either of the cereals, so I replaced them with honey Cornflakes and All-Bran Flakes with raisins. That being said, they were delicious. So I’ll try this one again, and hope my cookware forgives me. Here’s the recipe in any case, so perhaps someone else can identify what went wrong. 1. Set oven at 180°C, and butter 3-4 bread pans. 2. Cut margarine into blocks and put into large saucepan with sugar. Heat slowly until melted. Beat well. 3. Remove from stove and beat in buttermilk, followed by eggs. Mix well. 4. 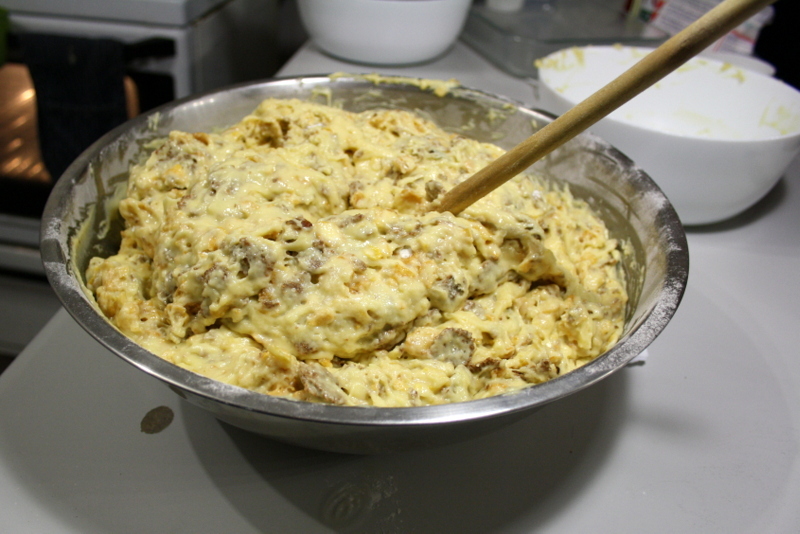 Mix dry ingredients and add to saucepan. Blend well. Batter runny. Pour into pans. 5. Bake for about one hour. 6. Flip rusks from pans and allow to cool down completely before cutting. Place separated rusks on oven racks and dry out overnight at 100°C. Insert a wooden clothes peg to keep oven door slightly open.